Seriously, many of you must have done this at least once. 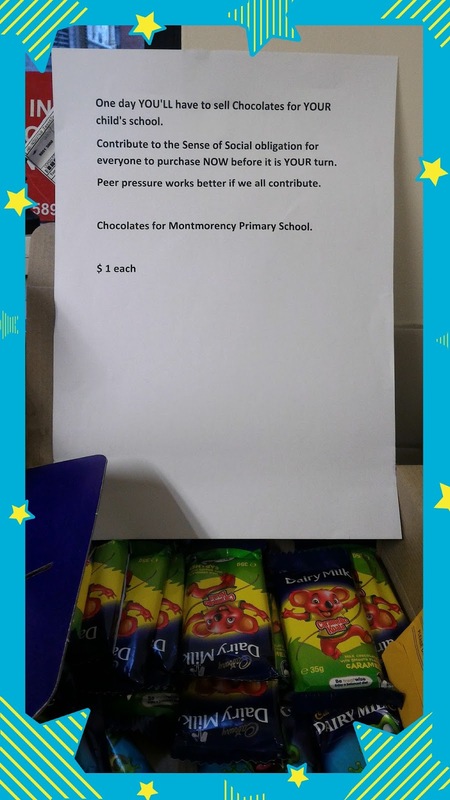 Selling Chocolates, on the behalf of your Child to raise donations or funds to your child’s school or some Welfare society ? . So, I walked into the kitchen at my workplace to warm up my lunch and right there on the Microwave, I saw a box of Chocolates (Freddo Frogs) and an interesting message “ One day You’LL have to sell Chocolates for Your Child’s school. Contribute to the sense of social obligation for everyone to purchase NOW, before it is your turn....” This raised some interesting thoughts and doubts in my mind about law of Karma, action, inaction and reaction. Logically speaking, as per the above statement, we can derive that everyone who has or would have a child, children will have to sell chocolates, because it is normal that almost every kid school goes to a school. And, every school has and will have one of these fund raising activities, passed on to its students which are passed on to their parents. After all, it is for a good cause and kids should learn these things quite young and of course parents are there to support them. Then, secondly it is a social obligation to buy a Chocolate because who knows, one day you will be doing the same thing. And, if you don’t buy one – tomorrow you may have to sell chocolates yourself and then, because of your bad Karma, you won’t be able to sell any chocolates, either eat them yourself or donate them to your friends for free and pay from your pocket. What if you don’t eat chocolates at all and you won’t buy or sell any chocolates ?. Shut up you silly mind, I said to my mind. It is really getting complicated. 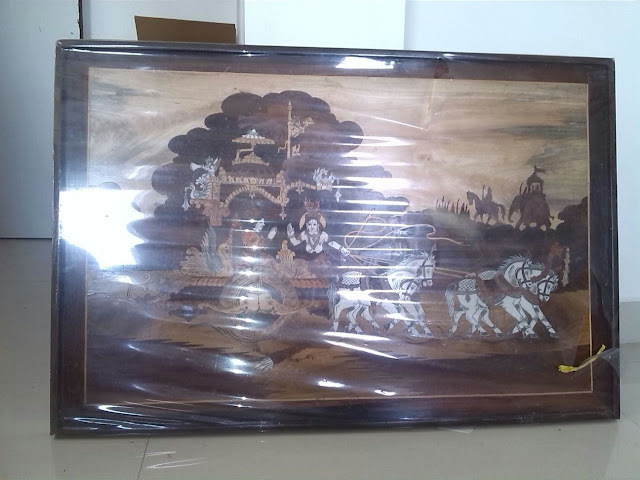 Of course, the seller (one of my colleague, did not use the word Karma but, that is what it implicitly means.) These days, everyone knows about Karma and that’s how all the roadside beggars, Chuggers gets all the money. Really, the intricacies of Karma – the law of action and reaction are very hard to understand. If this can get so complicated for a simple thing like this one, what about our daily dealings ? Translation: The intricacies of action are very hard to understand. Therefore one should know properly what action is, what forbidden action is, and what inaction is. 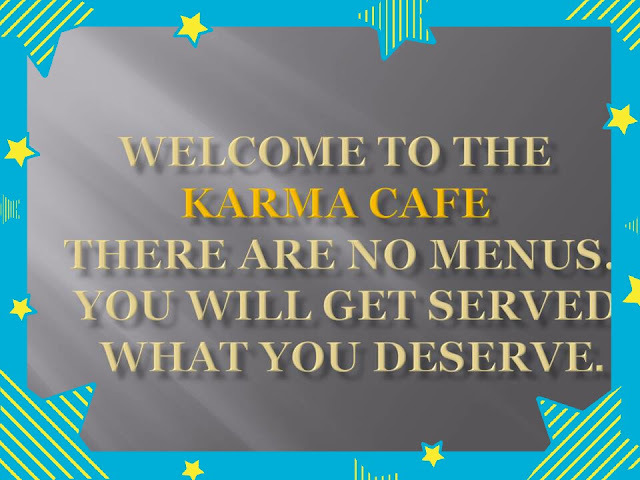 So there is Karma – an action or deed performed which produces resultant good or bad reactions, Vikarma – actions that are performed through the misuse of one's freedom and for which one suffers in the present life or by going down to take birth in the lower life forms and Akarma - Actions that free one from the cycle of birth and death. There is also something else called Ugrakarma – actions that are really harmful to a person doing them and also to the whole society and environment. So Bhagavad Gita advises us that if one is serious about spiritual life and desirous of getting free from this material body, do something good for ourselves and for the whole society, one needs to be careful about the actions one is performing. Because, Karma (Vikarma, Akarma, Ugrakarma) is like a fire, whether you know it or not, it will still burn – if not handled properly. Now sometimes people might get so much bogged down by thinking all these things and they decide to stop doing any work or activity. Infect, this is what Arjun wanted to do. He wanted to renounce work because work means actions and reaction. But Lord Krishna explained him that the very nature of a soul is to be active and conscious. No one can service in this world by inactivity, even if one is inactive, his mind is always actively thinking. Thus one who physically restrains his senses but, mentally thinking about the sense objects is called a pretender and he cannot achieve any good. Lord Krishna in Bhagavad Gita explains, how one should perform his duty without expecting any results, always thinking of him, offering the results to him called Karma Yoga. There is also Jnana Yoga, path of Knowledge and Bhakti Yoga – path of devotional service explained in Bhagavad Gita. Knowing all these will make one not hate Karma but, appreciate it.I recently read a facebook status message which read " Love the Karma ; The guy who to told me off in the parking lot, came for the job interview". 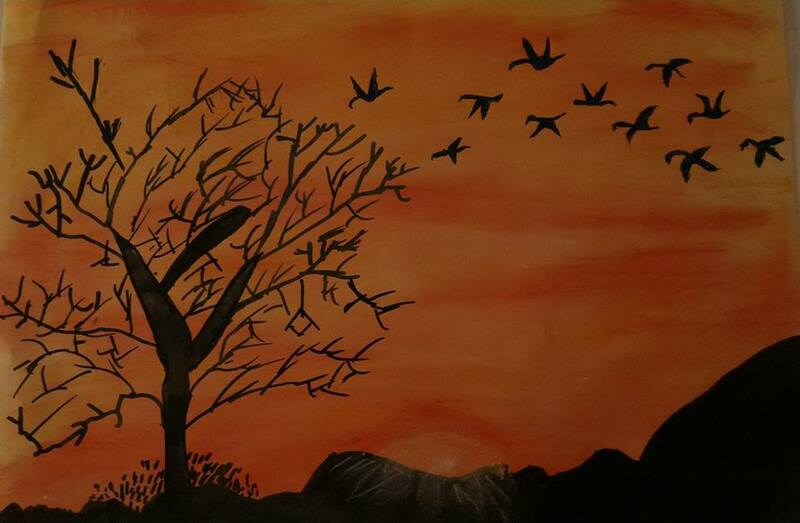 “Wow, it a beautiful painting of a Sun setting” –I said, looking at this painting of my 8 year old son. “No Daddy, it is a sunrise” my son replied. “Oh, sorry it looked like the birds are coming back home” I replied. “No, they are actually flying away for food” my son said.Ok, whatever it is, it’s a nice painting - I quickly corrected myself. So, this is what it is. Every one of us has their own perception of reality, what they see, how they see and how they perceive things. Depending on one’s mood, perceptions and Psyche one interprets things in a different way. I am sure, someone else looking at this might wonder, where is the sun ? One of the question or thought that I always get and many philosophers wondered is that, does two people share same reality. Do they see or the same object or hear the same sound at the same time. How do we know ? We simply assume that because, this is so and so, I can hear, feel, touch it, the other person also should be perceiving it in the same way. But, it is a well-documented, researched and noticed fact that our perceptions are greatly influenced by the amount of attentions that we pay to a particular thing, by past experiences, motivations, context, faith and so many other factors. In other words, our reality is built by ourselves or the experience of reality is psychologically constructed. An interesting verse from Srimad Bhagavatham explains that “Atmavan Manyatae Jagat” - everyone looks at the world from their eyes, thinks of others from their position. For example, when a person is hard of hearing, he thinks others can’t hear. A man thinks others like himself. I have recently experienced this thing.Something happened to my right ear and for about, two days I could not hear anything. But, when I speak, my voice would amplify and I would hear it myself and too loud. So, what I used do was, to speak too soft or low to others and my friends would not understand what I am saying and they were saying, what.? Thank God, it’s all over and I am back to normal. There is a nice story of Frog who used to live in a small well. One day, another Frog which visited a Ocean came to see him and was trying to explain him how vast is the ocean. But, this frog which is accustomed to living in a small three feet water and had no experience of seeing an ocean is trying to figure out how big is the ocean compared to his well. He said, is it bigger by 10, 20, 100, 1000 times.? How can there be any water reserve that’s bigger than that.? An Ocean is beyond the limits and comprehension of that Frog in the well. Similarly, people try to apply their logic and reasoning to know, find out God. They try to define God by logic, reasoning, by experiments. But, the Supreme God is beyond our material sense perception and material knowledge. For example, think of Something like – God Paradox or Omnipotence Paradox, which try to define God and his powers through logic and reasoning. Man can go on arguing for centuries and millenniums but, cannot come to a conclusion. Is an omnipotent entity logically possible? What do we mean by "omnipotence"? What do we mean by "power"? What do we mean by "logic"? What is the relation between power and logic? The omnipotence paradox states that: If a being can perform any action, then it should be able to create a task that it is unable to perform. Hence, this being cannot perform all actions. On the other hand, if this being cannot create a task that it is unable to perform, then there is something it cannot do. In the Mahabharata it is mentioned that the Supreme God cannot be perceived by logic and reasoning but, he is actually residing in the hearts of the great Paramahamsa devotees and through their mercy one can learn about the God. Lecture on SB 7.9.8 -- Hawaii, March 21, 1969: So our folly is that we are trying to study Krsna, or God, by our own standard, frog standard. We do not know how great Krsna is, how His potency is great, how He is manufacturing, how He is... Because we think, "If we have to manufacture something, I require some tools, I require some energy, I require some ingredients. I have to collect it. Then I can make." Therefore we are surprised, "How Krsna can make, or how God can create, this universe? Where is that instrument? Where is that ingredient?" They cannot. They are thinking in that way, that "I require instrument. Krsna requires the hammer and the saw to manufacture this comic manifestation." I am thinking in that way. Therefore I cannot believe it, how the cause of this cosmic manifestation can be a person. They are thinking impersonal. Impersonal bigness, they think it is very important. Actually, it has no value. Background is person. Krsna says in the Bhagavad-gita that “brahmano hi pratisthaham” I am the basis of the impersonal Brahman. That is the mistake of civilization. We think everything in our own standard. I indirectly heard of people saying irrational things about having a picture of Lord Krishna Instructing Arjuna- famously called as Geethopadesha.All these comments are based on ignorance or lack of spiritual knowledge and misunderstanding of the Scriptures like Bhagavad Gita or Mahabharata. These comments are baseless and absurd. One person said that the health of the person got affected immediately after putting one of these picture at home, someone said there is lot of quarrel and fighting within the family. But, millions of these Pictures exist in temples and homes in India and all over the world. Recently I heard these type of question from someone close to me, I thought I will write an article that will dispel the people's doubts, wrong notions and myths. The question was, Is it OK to keep a photo of Geetopadesh at home.? Someone told us that, keeping the picture creates rivalry and fight amongst brothers. Firstly, all these kind of advices and comments should be completely ignored. Because, it is clear that they do not know, what they are talking about. People try to apply their mundane logic and reasoning to the spiritual matters. Geethopadesha or Srimad Bhagavad Gita, is the divine discussion between Supreme Lord Sri Krishna and Arjuna.Bhagavad Gita contains 18 Chapters and 700 verses. Bhagavad Gita is really a book for the whole mankind because, it contains the explanations to the mysteries directly related to a human being and the world around them. It explains the 5 main topics which deal with the knowledge of Isvara - Supreme Lord who is the supreme controller, The jiva or the living entity which is controlled, the relationship of a living entity to the Supreme, Prakriti or the material nature, Kala – the eternal time factor and the Karma – the action and reaction experienced by the living entities. Bhagavad Gita, actually enlightens a human being to actually to fight – an internal battle that everyone has to go through, every day and every moment of life. Reading it assures one’s victory over the greatest internal enemies called Arishadvarga, the six passions of mind or desire, which are kama (lust), krodha (anger), lobha (greed), moha (attachment), mada or ahankar (pride). Bhagavad Gita, not only tells a person how to become, tolerant, humble and see everything and everyone in relation to the Supreme God but, it also makes one realised that we are all Spirit souls, who are separate from this material body. The body changes but, the Soul remains the same.Thus, the actions we perform in one body and their reactions are carried forward to our next body.And, also our actions and behaviour in this body determines our next body. So, please do not have any doubts or negative thoughts that this picture will cause trouble or friction among the family members. Hang the painting in a prominent place in your house like a living room or anywhere you can constantly able to see it. And each time you see the picture, may Lord Krishna inspire you to become righteous, uphold dharma, be truthful and believe in god. TRANSLATION : Always think of Me and become My devotee. Worship Me and offer your homage unto Me. Thus you will come to Me without fail. I promise you this because you are My very dear friend. Yes, in this life things doesn't always go as per our plan and more shockingly it looks as though, the more good we do, more bad things are happening to us. And, then we start grieving, why is this happening to me.? I have been just and good for as far as I remember. But, remember life doesn't start and end with this body we have today. We have numerous lives and numerous bodies before and who can tell what good or bad things we have done in our past lives.? Excuse my brevity but, I will tell a brief incident from Mahabharata that illustrates the powerful law and effects of Karma. After the Kurukshetra war, Dhritarashtra questioned Lord Krishna this way.” Krishna, I know and also people say that you are the Supreme Lord in a human form. Thus, I want to ask you this.How unfortunate is that, I was born blind, even though had 100 sons, today not even one remains.? What kind of justice is this. ?.” To this Lord Krishna replied, my dear King- hundred lifetimes ago, you were a hunter.One day to climbed the top of a tree and when about kill the small birdlings, the mother bird attacked you.You then, pierced a arround into its eyes and killed all the baby birds. Then, Dhritarashtra asked – but Krishna, why hundred lives.? and Krishna replied - Because, to beget 100 sons, you need a lot of piety and it took you 100 lives to get that good credits. Again, dont get mental about what wrong things, you have done in your past lives, consult astrologer and spend money on some pooja or ceremonies. TRANSLATION : Abandon all varieties of religion and just surrender unto Me. I shall deliver you from all sinful reactions. Do not fear. 'Whatever happened, happened for the good. Whatever will happen, will also happen for the good. What did you lose that you are lamenting about? What did you bring with you that you have lost? What did you produce that got destroyed? Whatever you have, you received it from here. Whatever you gave, you gave it back here. So go-ahead and keep this picture where ever you want and I will guarantee that you will get immense spiritual and material benefits just by having this in house. Look at the picture, think of the love and mercy Krishna has for his devotees. He did all the best he could do to avoid the war. He took up the menial job of a driver (Charioteer) because of his compassion and love for his friend,devotee Arjuna. He gave wealth equal to him, simply by accepting some chipped rice from Sudama, his childhood friend. He eat Banana peels offered to him with love and devotion by Vidura and his wife.Rejected opulent preparations made by Duryodhana because there is no love. A god who is bound by his devotees love, mother Yashoda tied him to a grinding stone.What to speak of his devotees, he awarded liberation to Putana a demoness who came to kill him when he was merely a baby. And, also all the demons who got killed by him got liberation. So why not have all these in your home ?